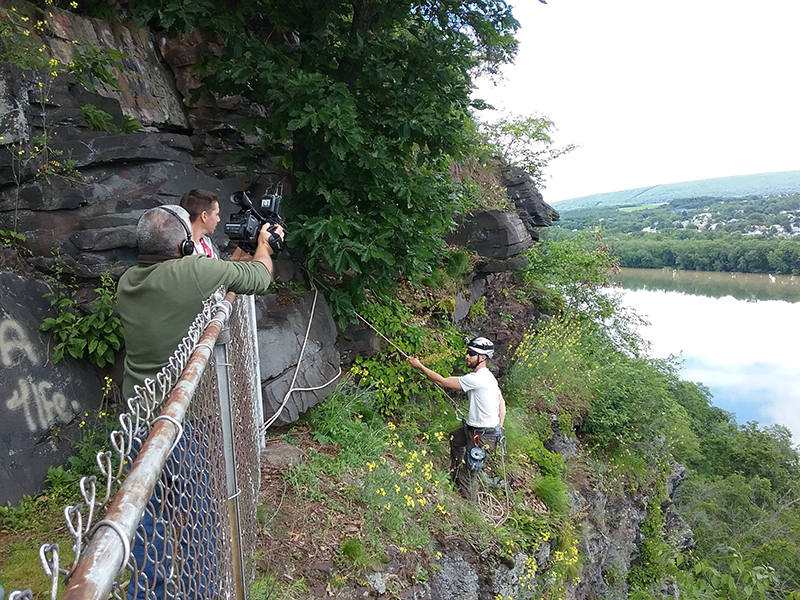 LEWISBURG, Pa. – While rappelling the nearby 350-foot Shikellamy Bluffs hunting for an endangered plant last summer (Jason Cantley rappelling in photo), Bucknell University biology professor Chris Martine and his student researchers unexpectedly helped discover an even rarer plant. They found the globally imperiled Heuchera alba — a wild relative of the perennial garden Heuchera — and established the first state record of the imperiled species. During their expedition along the cliffs last summer, Martine and his team were initially looking for the Pennsylvania state-endangered golden corydalis. But in the process, they found a rare native member of the coral-bell genus Heuchera. The first to recognize the rare species from Martine’s (@MartineBotany) tweeted image was Folk (@ry_folk), a Heuchera specialist. Surprised by this rare find, Martine quickly tagged fellow Twitter-savvy botanist Schuette (@mossman2000). Their discussion revealed that another possible Pennsylvanian record of Heuchera alba, commonly known as white alumroot, was recently posted by Schuette himself on the citizen science biodiversity observations app, iNaturalist. After examining specimens they collected along the cliffs, the team turned to historical collections held at Bucknell’s Wayne E. Manning Herbarium to further validate their Twitter-fueled discovery. What they learned was that local botanists had been misidentifying this species for over a century. Armed with new data on habitat preferences, the researchers searched for and discovered seven more populations of the rare plant that represent a significant range expansion into Pennsylvania. “If you look in the book Plants of Pennsylvania, it doesn’t include Heuchera alba because it was not supposed to be here,” Martine said. “But this will have to be updated in the next edition of that book! “Importantly, this discovery is not just a cool showcase for how science and modern communications outlets can work together, it also gave us key information on the status of Heuchera alba that can guide future conservation efforts,” Martine added.